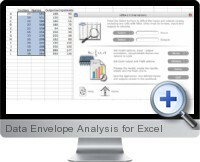 Data Envelope Analysis (DEA) for Excel is a sophisticated analysis add-in that produces extensive results for the main DEA models used today and automatically creates Excel charts. Data Envelopment Analysis is a powerful method widely used in the evaluation of performance of Decision Making Units (DMUs). These can be business units such as points of sales, branches, franchisees, departments, and public agencies. Data Envelope Analysis is commonly used to evaluate the efficiency of a number of producers. A typical statistical approach uses a central tendency approach which evaluates producers relative to an average producer. In comparison, DEA uses an extreme point method and compares each producer with only the "best" producers. The producer is usually referred to as a decision making unit or DMU. A fundamental assumption behind this method is that if a given producer, A, is capable of producing X units of output with Y inputs, then other producers should also be able to do the same if they were to operate efficiently. The analysis finds the 'best' virtual producer for each real producer. If the virtual producer is better than the original producer by either making more output with the same input or making the same output with less input then the original producer is 'inefficient'. Data Envelope Analysis for Excel provides this sophisticated analysis within the Excel environment. It produces extensive results for the main DEA models used today, and automatically creates Excel charts. In view of the analyst's need to present results in a professional way, the add-in also supports the production and customization of Adobe Flash charts which can be easily transferred to any browser based environment.